COOLMAX technology evacuates humidity to keep players fresh and dry. This shirt is lightweight and comfortable and comes with a casual V neck polo collar for a comfy fit that gives you added breath-ability and greater movement around the court. COOLMAX technology evacuates humidity to keep players fresh and dry. 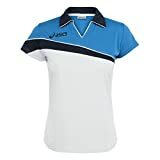 This entry was posted in Tennis and tagged Asics, Ladies, Polo, Shirt, Tennis by FPSports. Bookmark the permalink.